Soldier Canyon is a wonderful scramble, with lots of rocks and slabs, some good class 3 scrambling, and even some class 4 if you so choose. While it’s not well known to the general hiking population, it’s quite popular among people who enjoy scrambling over boulders and up rock steps. 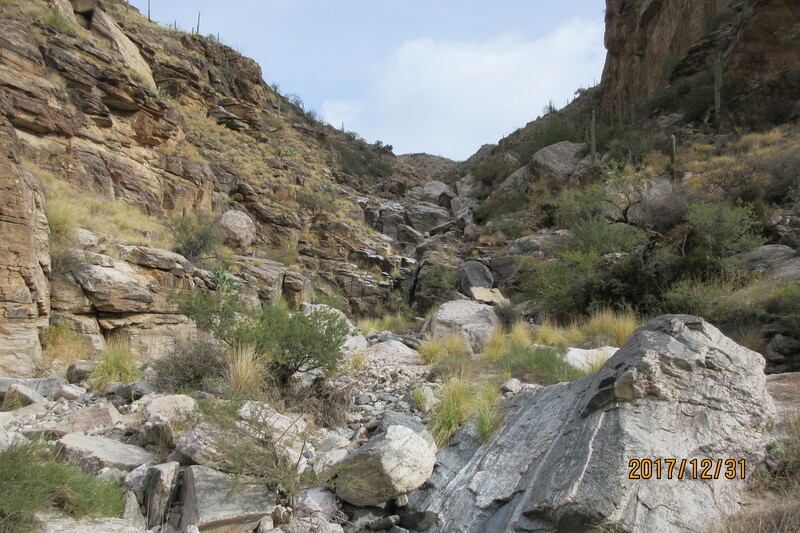 It’s also done as a descent with some rappels at the very top. 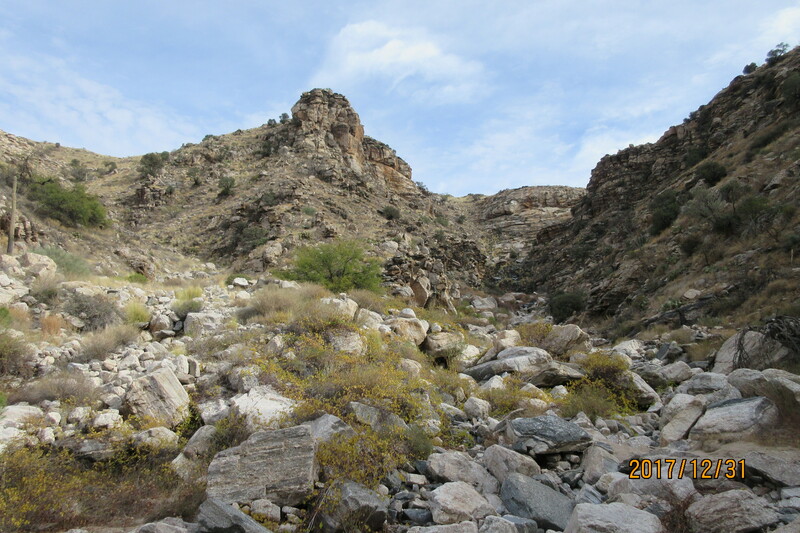 I learned about Soldier Canyon when climbing the Black Gate of Mordor scramble and decided to come back and do the whole of Soldier Canyon, which I did on 12/31/2017. Park at the parking lot just before the first hairpin on the Mt Lemmon Road. 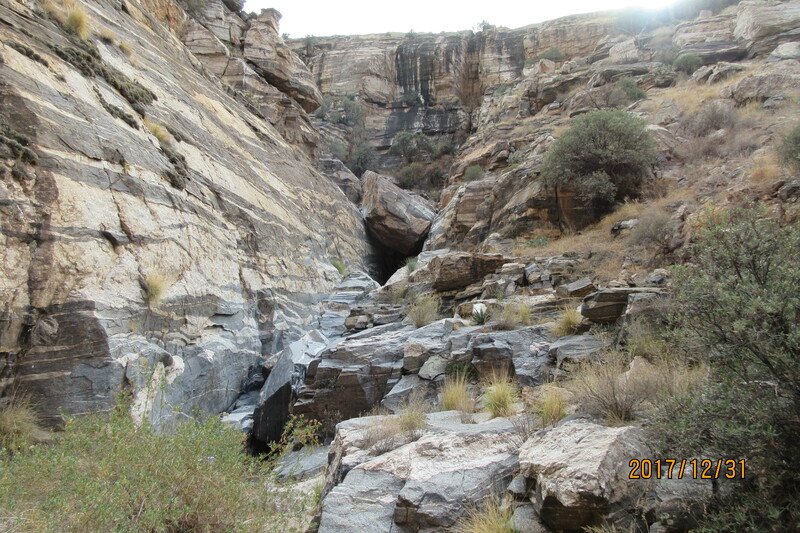 Start hiking and scrambling up the obvious canyon on beautiful white rocks. You can skirt many of the obstacles but it’s fun to try and climb a fairly direct line up the canyon. There’s quite a bit of class 3, and some class 4, depending on which boulders you want to climb over. 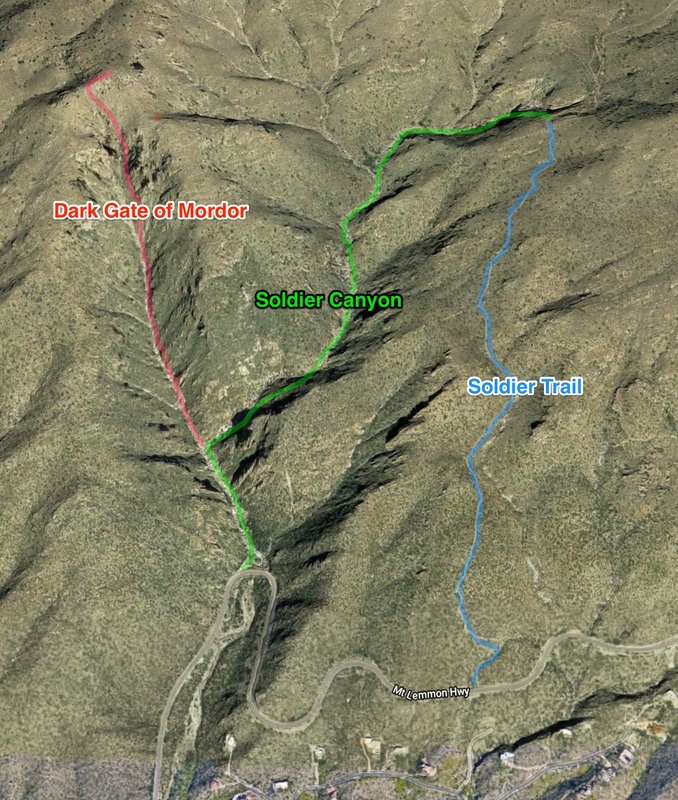 So, turn turn right and follow Soldier Canyon up. The first rock step is most easily passed on the left. Once over this step, you can pretty much keep a more direct line for most of the way, depending on how difficult you want to make it. Eventually you will come up to some giant boulders where it’s less obvious which way to go. I stayed on the right side, but many people go further left. Soon you’ll reach a cave-like slot that you go through, and you’ll find yourself below a cliff that is a well-known rock climbing area called Rivendell. Keep going up the canyon until it splits near its end. Take the right hand branch, and where it seems that it dead ends in a cliff you will find class 3 ledges and shelves that climb up left then right then left, leading you to the base of a smooth cleft that leads to an enormous boulder that blocks the way and looks terrifying to climb past. You can exit out and climb the slope to the left of this area if you choose. Otherwise, for fun, climb the smooth cleft to below the boulder, then return. Now climb up the slope on the right hand side. Eventually you will top out a few feet below the well-traveled path of Soldier Trail. Turn right and follow this back down to the Mt Lemmon Road, which you reach about 1 mile above your car.